Hale has said that she wants to retain the current power-sharing arrangement with the chairman that has been in place since 2009. Wilkes has said he wants to reverse those changes made by the four voting members of the BOC over the objections of Davis and go back to a system of a strong chairman, as was the case when he ended his 20-years on the Commission in 2004. Voters will get to pick between those two positions when polls open at 7 a.m. on Tuesday. The polls close at 7 p.m.
A sizeable number–1,592–already made their decisions during early voting, which ended on Friday. 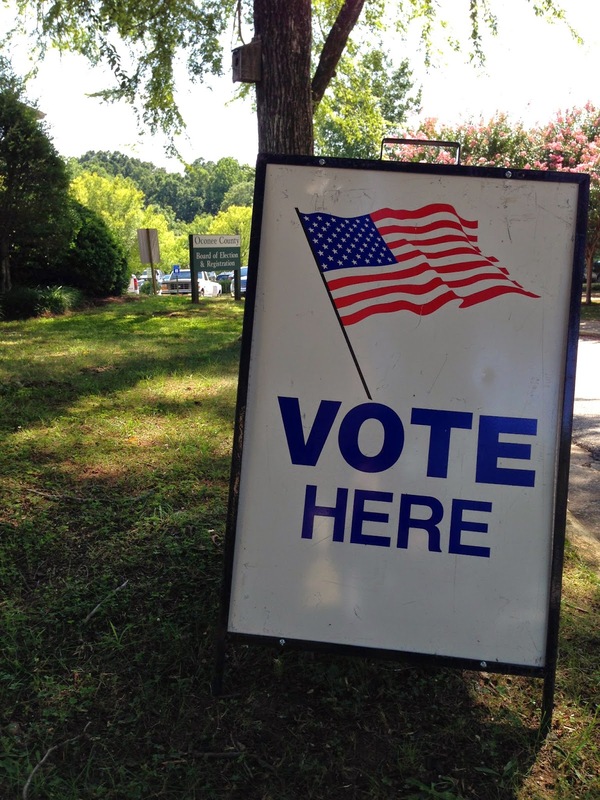 In early voting for the May 20 primary, 1,681 cast a ballot, suggesting that turnout could be nearly as high in the runoff as the 23.4 percent figure in May. Davis made it almost certain that he and the role of the chairman would be an issue in the election. He played a strong role earlier this year in setting the timetable for and the priorities for the Special Purpose Local Option Sales Tax referendum now to be on the ballot in November. Hale was joined by Commissioners John Daniell and Jim Luke in objecting to Davis’ timetable and some of his priorities. Davis also played a strong hand in shaping the Fiscal Year 2015 budget, approved by the BOC on June 3. That strong hand and the resistance to it by at least three of the four voting commissioners, including Hale, came to the fore at that June 3 meeting. At issue was funding for a cost of living allowance for 78 county retirees that Davis inserted into the budget without telling the other commissioners. The video below shows a challenge from Luke and a response from Davis in which Davis finally admitted that he had bypassed the four commissioners and worked exclusively with the staff to get the money for the increase tucked into the budget. The gap between when Luke first asked how the money for the retiree benefit was added to the budget and when Davis acknowledged that he did it was 10 minutes, though the video above does not reflect that. The full video of the discussion of the budget at the June 3 meeting is at the bottom of this posting. The role of the chairman is not the only issue on which Hale and Wilkes disagree. In separate interviews I conducted with the two candidates, they took different approaches to a number of issues before the county. They also agreed on a number of issues. But in those interviews, and in the three candidate forums held in the run-up to the May 20 Republican Party primary, Hale made it clear she wants to retain a strong Commission as a counterbalance to the chairman. Wilkes said he wants to go back to a strong chairman, as was the case when he ended his term on the Commission. The full video of the Hale interview is here, and the full video of the Wilkes interview is here. Davis’ role in getting money added to the budget for retirees without consulting the other commissioners illustrates the possible role of a strong chairman, who has an administrative assistant, works full-time, and has an office in the courthouse and easy access to the county staff. The other commissioners have part-time assignments and no offices. The chairman votes only when there is a tie among the four other commissioners. The possibility of including a salary increase for county employees to compensate for increased living costs was discussed during the open budget hearings the BOC held with elected officials and county department heads in March. Following those meetings, County Finance Director Wes Geddings put together those requests and projected revenues to create the county budget. He made no mention of any change in benefits for retirees. Geddings also discussed the budget in the regular May 27 Commission meeting that followed the public hearing on the budget. He made no mention of the retiree benefit at that time either. The four voting commissioners were first informed of the retiree benefits in a two-paragraph email message Davis sent them at 8:28 a.m. on May 30, a Friday and three days after the first formal presentation of the budget. The first paragraph of the email dealt with the budget for the sheriff. The second paragraph said that County Administrative Officer Jeff Benko would be sending out the final budget packets later in the day. Included, Davis wrote, are “the personnel sheets indicating the 3% COLA for current employees and retirees.” COLA stands for Cost Of Living Allowance. Benko sent a second email to the four voting commissioners and to Davis at 2:02 p.m. that same day saying he was sending them envelopes via the U.S. Postal Service. Geddings told the commissioners at the June 3 meeting that the budget he had presented to them and to the public on May 27 included $334,000 for the COLA adjustments for current employees and retirees, though that figure does not appear anywhere in the budget released to the public. That $334,000 figure included $26,000 for retirees, Geddings said, though he acknowledged that it had not been identified as such. Giving the money to the retirees will require a change in their retirement programs, Geddings said, and that change will require a vote of the Commission. Absent that need for a subsequent Commission vote, it is unlikely the issue ever would have come to the attention of the four voting Commission members. Geddings also said the COLA adjustments for the retirees will result in added costs in the future as those increases are factored into future payments. Hale has served on the Commission since 2000, the year Davis was first elected to the Commission as chairman. Davis had not served on the Commission prior to that election. Wilkes, who took office in 1984, served his final four years with both Davis and Hale. He was defeated by Chuck Horton in 2004. Horton joined with Hale, Luke and Commissioner John Daniell is pushing in 2009 for the change in power of the chairman and the Commission. Horton unsuccessfully challenged Davis for the BOC chairmanship in 2012, and Mark Saxon was elected as Horton’s replacement. Saxon so far has shown no signs of challenging Davis. Since there is no Democratic candidate for the Post 3 position, the election of Hale or Wilkes on Tuesday will tilt the power of the Commission either toward or against Davis. The role of the chairman has been something the county has struggled with over the years, including during the time Wilkes was on the Commission. The county commission system that Oconee County has was established in 1917, and it included a strong chairman. The legislation passed by the Georgia General Assembly specified that the chairman was to be a full-time position. In 1988, with Wilkes on the Commission, the chairman's position was set as "part time," and the duties of the chairman were greatly restricted. In 1998, the enabling legislation was changed again, restoring the power of the chairman, who was "To act as the chief executive officer of the county." The legislation, which remains in place today, did not specify if the chairman was a full-time position, but that has been the case. The changes the BOC made in 2009 did not affect that enabling legislation. All the commissioners did was change the organizational chart for the county, which is not written into the enabling legislation. The change specified that the county Administrative Officer and the county Finance Director report to all five commissioners equally and that all other department heads report to the county Administrative Officer. Davis had created an organization chart in which everyone reported to him and he then passed on information to the commissioners as he saw fit. The complaint of the four commissioners was that they did not get timely and complete information and were being forced to vote based solely on what the chairman provided them. Voters opting for the Republican ballot on Tuesday will get a chance to vote for three races in addition to for the Post 3 Commission slot. They will be able to help select the Republican nominees for U.S. Senate, for the U.S. House from the 10th District, and for the State School Superintendent. Voters who voted in the Republican primary in May as well as registered voters who did not cast a ballot in May or who cast a ballot but did not vote in either of the party primaries are eligible to vote in the runoff. The Democratic runoff only is for the state School Superintendent nomination. Voters who voted with the Democrat ballot in May, who did not vote in May or who voted but did not pick the ballot of either party can vote in that race. The Republican Party held a debate on July 8 between the two candidates for the House seat, Mike Collins and Jody Hice. Sarah Bell made a video recording of that debate and placed it on her Vimeo web site for public viewing. The video below, which runs about 13 minutes, contains the entire discussion at the June 3 BOC meeting of the Fiscal Year 2015 budget. The video clips above were taken from this longer video. "At issue was funding for a cost of living allowance for 78 county retirees that Davis inserted into the budget without telling the other commissioners." Was this even legal? If it is legal, it's clearly unethical and unprofessional. Melvin Davis and his massive ego are spiraling out of control. The county needs a county manager who reports to the five commissioners. No more full-time commission chair. It never works...look at Vernon Jones and Burrell Ellis in DeKalb, and the too numerous to mention scandals from them being a fulltime commission chair/CEO. Melvin and his out of county business buddies are turning Oconee into Gwinnett-lite. Things have to change before it's too late.